Side view of the jug. The same Chinoiserie design is printed on each side. 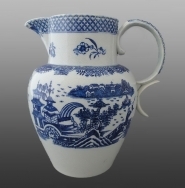 A pearlware commemorative jug printed in blue with a line-engraved Chinoiserie design. The name "James Taylor" and the date "1797" are skillfully painted in under the glaze. The pattern is enhanced with a variety of fruit and floral motifs. Two distinct borders are employed: A geometric and floral border is placed above the central pattern and a simple geometric border is printed both on the interior and exterior neck of the jug. The latter also decorates the handle. The pattern printed on the sides is shown below.